As one of the most successful hotel management companies in the country, we thought it was time to share some insight from our team of experts. In this article, we will be speaking to one of our hotel management consultants – Sales Director Clare. What drew you to a career in the hospitality industry? I have always thoroughly enjoyed being a hotel guest and I knew I wanted to work in the sales arena. To marry the two, I approached a hotel nearby and applied for a position. I really clicked with the GM at interview stage and that was it – I knew I wanted to be part of his team. Starting as maternity cover sales manager for De Vere Venues, over 11 years I would then work my way up; my roles included Director of Sales. I loved the thrill of closing a sale and then being on property to see the guests having a great time. 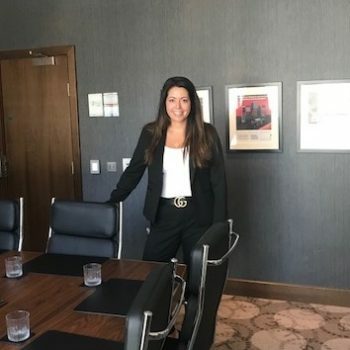 With De Vere I ran the South East and London region and the last role I had with them was managing all third-party providers – I was part of the commercial team, driving partnership agreements. What are your main goals for 2019? Can you tell us about some of the biggest challenges you face at present? My main goal is to be part of the growth strategy at M&T, and to develop and bring together a team of great sales people who deliver ‘more than expected’. Challenge wise, it can be difficult to find likeminded, great people and finding enough time in the day is always a task! I’ve learnt as I have got older to focus my attention where I will see the biggest return and at the moment, that focus is recruitment. What piece of advice would you give to ‘Sales People’ entering the Hotel industry today? Stick with it – it’s not easy and its certainly not all great dinners and show rounds. You have to be relentless in your approach when it comes to winning business in 2018, but don’t over complicate it. People buy people so with the right strategy and the right team anything is possible – you must stick at it. Does the evolution of the technology impact how you sell a hotel’s services? From a domestic consumer point of view yes it does. Everything is controlled in the palm of our hand now with mobile technology so the way we buy has changed; our influences are different. When it comes to the corporate customer I still think the traditional sales approach is the best one, but you have to know when to introduce ‘good’ tech and that means looking at what will be easy to work with. This can include ‘paperless contracting’, ‘virtual check in’ and WiFi that stretches to cover outside space. How do you adapt the strategy you apply to a branded hotel, to benefit an independent one? The sales strategy is so hotel specific, but everyone has a gap in their business. Part of my role is to un-earth where the gap is and calculate how I can support the property in bridging it. Irrespective of brand, the principles are the same but the levers you pull will be different; you just need to know who to reach out to for support. Our hotel management consultants are waiting to offer you the tailored support that you need. Are you ready to contact one of the most successful hotel management companies in the country? Call or email us today to see how we can benefit your business.